What does Thanksgiving mean to an expat? Celebrants say traditional American holiday has become universal. About 200 immigrants (olim) gathered to celebrate Thanksgiving Thursday night, in a special traditional dinner hosted by Nefesh B'Nefesh (NBN), Friends of the IDF (FIDF), and the Ministry of Absorption and Immigration. Arutz Sheva visited the lively dinner hall to discuss what the traditional American holiday of gratitude meant to the expatriates. 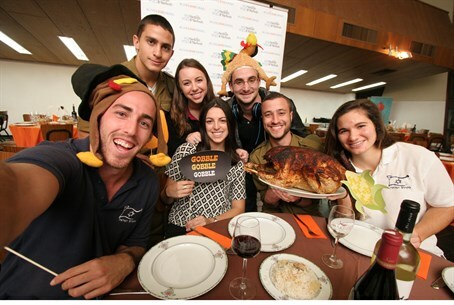 "Thanksgiving is the most family-based holiday in the United States, and this evening is a great opportunity for us to allow many immigrants, including individual soldiers - who come to Israel alone, sometimes without parents and friends - to participate in a meal with other immigrants like them," said Erez Halfon, vice chairman of NBN. Several attendees stated that they felt that the dinner did just that: reconnect them with their new family - fellow immigrants. "Thanksgiving is a family holiday, and it is not easy to be away from family here," Yonatan Hamudot, one of the few lone soldiers at the event, stated. "But thanks to events like [these] I feel that I have a family here." "This Thanksgiving I'm grateful that I live in Israel, and could be surrounded by a large community of immigrants like me," he added. Several participants said that the Thanksgiving holiday has become universal. "I think that the Thanksgiving holiday can be adapted to any nation, any group," Josh Malchman, an IDF lone soldier who completed his service earlier Thursday, stated to Arutz Sheva. "Here, we're all olim - most from America, others from Europe - and we're all here together, to eat a meal as one, and say thank you." "We're Jewish, we're Israeli, and we're happy to be so," he added. "Thanksgiving in America now includes a lot of traditions," Maya Liss, Post-Aliyah Department representative for NBN, stated, noting that people celebrate "as a way of reflection" and that "people are thankful for being with their family." "And that's what we're doing here today," Liss added. "A lot of people have made Aliyah without their families, so other olim are their family."